She's beautiful! I can't believe that you made those pretzels the day before you had a baby! Looks at those lips & cheeks. Congrats!! She is such a doll! I'll have to make some of those yummy pretzels. You are amazing by the way. I can't believe you did all of that the day before she was born! 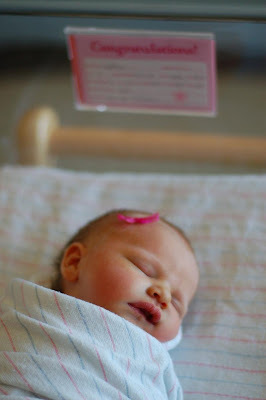 Congrats on such a beautiful baby girl. I love the bow! Happiness to you and your family! Congratulations! She is gorgeous, and much sweeter than chocolate! Congrats "Strawberry" family! She's beautiful. Yay, a baby!! Congratulations! Mmmm, pretzels. Congratulations on your gorgeous little girl! She is lovely. I was the one with the half-butter-and-sugar baby - the Dorie pregnancy diet definitely worked for me too! Congratulations! She is beautiful...she looks just like the picture of you on your blog! 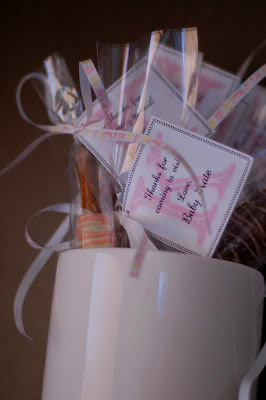 What a happy day..>I am going to make these pretzels for my sister's baby shower in November..perhaps they are good luck?! Oh, Anne! Congratulations! She's simply beautiful. I wish you all the best of everything and happiness always! I'm so impressed that you did the pretzels the day before you delivered Kate. Too much. I've been wanting to try my hand at caramel dipped pretzels, so thanks for this info. Get some rest and take care. Congrats again! Congrats on the safe arrival of your baby girl! She is beautiful and how thoughtful of you to make a delicious treat for those coming to visit. I have had these type of dipped pretzels before and they are really delicious. Congratulations Ann! She is just beautiful! She is so perfect! Congratulations and I hope you can get a little sleep occasionally! Yay and congratulations! I knew that was why you didn't post for TWD and was excited to hear! Mazel tov! We'll see you back online after you've slept a bit. OH ANNE, I'M IN TEARS SHE'S SO BEAUTIFUL !! What a beautiful girl, congratulations! You nut! I can't believe you posted a recipe! She's BEAUTIFUL!!!!! Congratulations Anne! She's adorably delicious! Congratulations! So impressed that you made treats to give to the dr/nurses/visitors! Hooray! She is perfect, Anne! 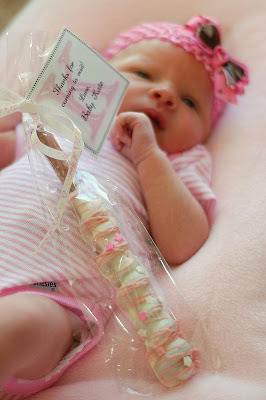 I love love love that you were dipping/wrapping pretzels in the hours before her arrival - you are a rock star. Congratulations to you and your family on the arrival of your beautiful baby girl. Congratulations! What a beautiful baby girl! Those pretzels sound fantastic. Congratulations! What a beautiful picture. Her little ears and lips are so cute! Congratulations Anne. what a gorgeous girl! she's definintely full of sweetness! congrats Anne! she's just perfect! Congrats! What a beautiful baby. I think you definitely qualify for Martha Stewart having made such beautiful thank you gifts for your hospital guests and especially the day before you delivered! Oh my goodness, what a beautiful little girl! First of all, your daughter is too beautiful for words...what gorgeous lips! Second, thanks for the recipe...I am definitely going to make them.